A light week to round out the year. Watch out for low-flying piranha. The next Splatoon map releases tonight, and it's going down quite deep. The Piranha Pit will release at the traditional update time this evening, and is a stage with a lot of mining conveyors that can change the flow of battle and provide height advantages. The mine is in a lake, so players will need to watch their step lest that first step cause an unforced errror. 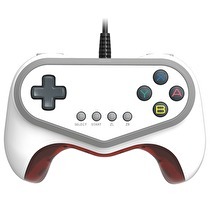 Includes the first directly wired controller for the Wii U.
Pokkén Tournament will have local play in its Wii U incarnation, but one player will be fighting alongside their Pokémon on the GamePad. And the price will certainly be right for them. The anniversary release of Pokémon Red, Green, Blue and Yellow in Japan will have several promotions, including exclusive new hardware. Time to get one last airing of grievances in before Festivus. As we first reported yesterday, Super Mario Galaxy is the main - in fact, the only new game this week for North America. The actual best Nintendo console game of the 2000s brings grand adventure, tricky platforming and the best princess in the Nintendo lineup, so be sure to pick it up. Father Squidmas is making a delivery tonight. The next Splatoon weapon update will arrive to splat kids over an open fire. The Rapid Blaster Pro Deco will arrive at the traditional update time, and will add a touch of class to one of the game's longest range weapons. The quick fire rate and long range is balanced by a slightly lower power. We've got space, castles and marshmallows that throw lightning. Although tomorrow's Wii U downloads will be light, but there will be plenty of jumping plumbers. Super Mario Maker, Splatoon, and more! Still adding onto the inexpensive game pile. Following last week's announcement of multiple eShop sales, developers in Europe have added more games onto the sale beginning on Christmas Eve. The closest we'll ever get to playing as the great, mighty Poo. A couple of new items will be dropping this weekend, one just in time for a great battle and the other to coincide with a recent Japanese Virtual Console release. Splatoon will get another addition to the combat roster tonight at 9 p.m. Eastern as the Tri-Slosher Nouveau will be available at Sheldon's. The Slosher variation has a Seeker sub-weapon and the Echolocator as a special. And they celebrate with a Squid Sisters concert. Splatoon continues to set sales records in Japan, and Nintendo's throwing a giant party to celebrate. You're a platformer now, you're a shooter now. The next major update to Super Mario Maker will bring the promised web portal and a few new creation tools. Launching Monday evening in North America, the update will add Super Mario Maker Bookmark, the online service that allows for searching and tagging of levels. The courses added on Bookmark will go to a special tab in Course World. The update will also show the first person to clear a course, as well as the fastest clear. The one with the giant blocky elephant in the room. Well, it finally happened; after six years of development, four years of console releases and a multi-billion dollar buyout by a console competitor, Minecraft is FINALLY hitting the Wii U. Our leading authority on all things Steve Andy Goergen has written a buyer’s guide on the subject, and his review will come soon. Plus results from the last European Splatfest. A fitting climax to a year of insane additions. Nintendo showed the final Super Smash Bros video presentation today, with multiple new content announcements for the forseeable feature. We also get another look at Dark Mewtwo. 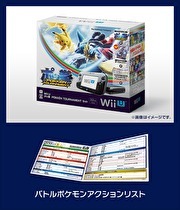 Pokkén Tournament’s Japanese website has been updated to include a Japan exclusive Wii U bundle. The bundle comes with a black 32 GB Wii U system, a copy of Pokkén Tournament, a special booklet, and a Dark Mewtwo amiibo card. The game and the bundle release on March 18th, 2016, with the bundle going for 36,000 yen. A few days late and a few hundred million dollars short. November's US sales had a few surprises and some disappointments for Nintendo systems and games. This week's Nintendo downloads in Europe have feature a massive sale in anticipation of the holiday season. Probably girding the eShop for Steve. Another major Nintendo maintenance will be going on this evening. The maintenance will begin at 5:00 p.m. Pacific time (8 p.m. Eastern) and is slated to run for approximately 10 hours (until 3 a.m. Pacific/6 a.m. Eastern). "Certain network services" will be affected. It isn't clear why the maintenance is taking place at the time it is - it's slated for working hours in Japan, and most maintenance sessions are about 12-24 hours later. After defeating the likes of Ifrit, Bahamut, and series newbie Amateratsu, players can summon them in battle.